Given the chance to work their magic with candy, the chocolatiers of Gnawnia have stepped up and joined forces with the local Trapsmiths to create this high calorie, chocolate, marshmallow and caramel Cocoa Crusher. By extracting the evil essence from the candy and infusing it into chocolate, they have been able to preserve the traps effectiveness while giving it a brand new look, feel and taste! The Limited Edition Cocoa Crusher Trap Skin can be used on the Limited Edition Candy Crusher Trap. The trap's stats (power, power bonus, attraction bonus, etc.) are not changed. The Cocoa Crusher Trap Skin could be purchased from the Haunted Terrortories 2015 Trapsmith in exchange for 10 Cobwebs. Hunters must have the Candy Crusher Trap in their inventory to obtain this skin. The Cocoa Crusher Trap Skin cannot be traded on the Marketplace or through Give To Friends. 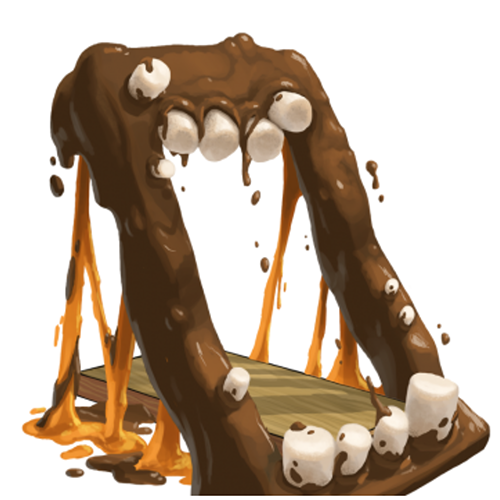 21 October 2015: The Cocoa Crusher Trap Skin was introduced as part of the Halloween 2015 event. This page was last edited on 9 December 2017, at 10:24.